My latest "enthusiasm" as my daughter Naomi put it, is to poke around in bird nest boxes. I'm not looking for anything in particular, just looking for the sake of discovery. This activity is restricted to the winter months when birds aren't nesting in the boxes, though I admit even in the winter it can be disruptive. Mice use the the smaller boxes if they aren't closed up, and you may encounter an occasional woodpecker. So with the goal being merely to look it was exciting to start finding dried mushrooms of various species in some of the Wood Duck boxes located at Westwood Hills Nature Center (Ok, I had another goal too. I also hoped to befriend a family of mice, but so far all attempts have not been successful. I guess I wouldn't make a good disney princess). There were five boxes with mushrooms in two separate locations, on opposite sides of Westwood Lake. In one location there four boxes with mushrooms out of six total boxes. In the other location there was one box with mushrooms out of six total boxes. The big question of course is who put the mushrooms in the Wood Duck boxes. My first guess was Red Squirrels, Tamiasciurus hudsonicus who are known to store mushrooms. But it was pointed out to me that the boxes were well protected from the ground by predator guards, and were generally not immediately near a tree, since a potential Wood Duck nest predator could also come from above, squirrels included. After that I was stumped, but then learned that Flying Squirrels, Glaucomys spp also store mushrooms. 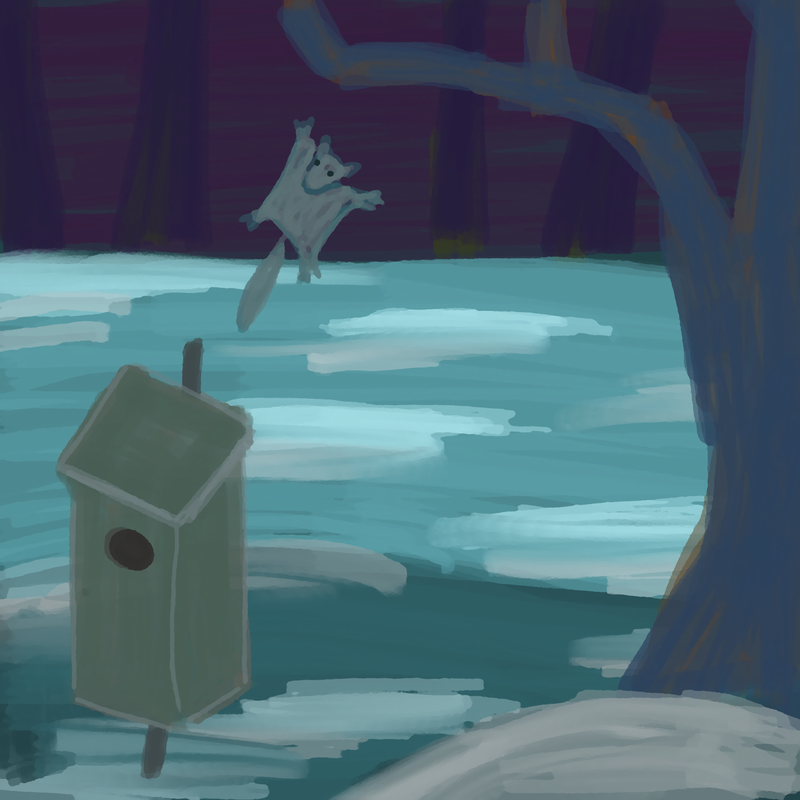 And the boxes were close enough to trees that a Flying Squirrel could glide down to them. Flying Squirrels, though common are very nocturnal and difficult to spot. I set up a trail camera to hopefully catch one in action. But no luck. But even without more concrete evidence, Flying Squirrels seem the most likely candidate.